I really enjoyed working on this project, which involved ongoing osprey research by scientists at the University of Montana right here in my hometown, Missoula. I was able to participate in their field work and also visit the laboratories where they analyzed the blood samples they got from osprey chicks along the local rivers. Ospreys are amazing birds, specialized for catching fish by diving down into the water and grabbing the fish in their sharp talons, then carrying it away for a meal. 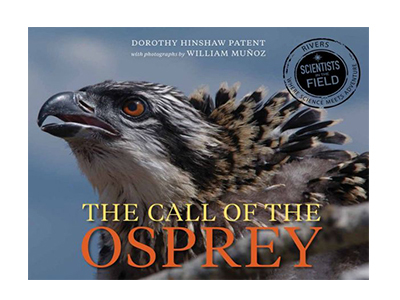 Readers can get a feel for how field research is carried out and can learn about the lives of osprey families. Two of the nests are equipped with videocams so viewers can learn the details of the birds’ lives. One thing that really impressed me about these great birds is the gentle care with which the parents tend their chicks.